FacebookEveryone has heard the old saw about bands having “a lifetime to write the first album, a year to write the second”. Similarly, most people can think of an instance or two of “sophomore slump” being more than just a clever bit of alliteration. London’s Veronica Falls seem set on not letting the former be any kind of obstacle and sidestepping the latter entirely. Their self-titled debut came out just over a year ago, but they’ve just announced the follow-up. Waiting For Something To Happen will be out on February 12 of next year and the first teaser track from it has been made available to stream, and as expected/hoped it’s another slice of deliciously retro, garage-punk-jangle-pop that might sound a bit sunnier with more major key wistfulness than you would have found on the debut, but it’s only one song of thirteen – there’s surely at least some of their trademark darkness still lurking in the corners. Exclaim has the full tracklisting, album art, and other bits and bobs announced about the record. A Music Blog, Yea runs some questions by guitarist Paul Rains of Allo Darlin’. The Joy Formidable have released a new video from their own sophomore effort, Wolf’s Law. It’s out January 23 and they’re at The Sound Academy on November 25 supporting The Gaslight Anthem. Natasha Khan of Bat For Lashes talks about her experience in the music industry with Exclaim. A new track from The Haunted Man has also been made available to download. MXDWN and Los Angeles Magazine talk to Laura Marling. NPR welcomes Neil Halstead for a World Cafe session. Johnny Marr has released a video for the title track from his solo debut The Messenger, due out February 26. Hear that, son? That’s the jangle. DIY has some updates on the next album from Primal Scream, targeted for release in Summer of next year. Atlanta Music Guide has a short interview with Ash; they’re at Lee’s Palace this Saturday night, November 17. 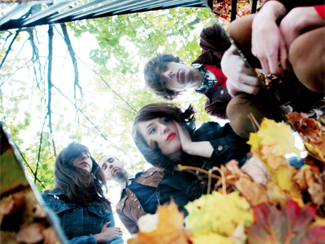 The Fly interviews Trailer Trash Tracys. One of the tracks from Charli XCX’s new Super Ultra Mixtape has been made available for download, if you prefer things in sub-three minute chunks. Rolling Stone talks to Richard Thompson about his new album Electricity – due out February 5 – and also have a stream of one of the new songs on it. Blurt reports that Dutch indie-rock veterans Bettie Serveert have targeted a February release for their new album Oh, Mayhem! and released a first video from it. Here’s hoping they take this opportunity to make up that 2010 Toronto show canceled at the eleventh hour due to visa issues. Sambassadeur have made the flipside of their forthcoming single “Memories”/”Hours Away” available to stream, helping to tide you over until the single is out November 20 and the new album is out sometime next year. Under The Radar talks to Carl and Adam of Shout Out Louds about how work is progressing on their fourth album. They hope to release it near the end of February 2013. Much Sigur Rós to report; they’ve premiered another video from the Valtari Mystery Film Experient over at Nowness, this one set to four of the songs from Valtari. Maybe it will be one of those screened at The Bloor on December 8. Further, the band have announced another North American tour for next Spring. The band made a total triumph of their last visit to Echo Beach in August, but instead of returning to their former home of Massey Hall for indoor digs, they’ll be setting up at the Air Canada Centre on March 30, albeit in the more-intimate theatre configuration. And lest you worry that arenas in any configuration are acoustic nightmares, know that The National made the same setup sound amazing last December and the magical elves that work sound for Sigur Rós did wonders with Echo Beach’s PA, so I have full confidence that this will sound incredible. Ticket details still forthcoming but public on-sale is this Saturday, so they’ll be available soon. And on top of all that, they will release a new EP to go with the tour on March 22. Hoo-rah. Björk has also rolled out a new video from last year’s Biophilia. Tame Impala have released a new video from Lonerism; The Chicago Tribune also has an interview.